After careful consideration of my skill set, leadership abilities, and passion I have concluded that I am unable to meet the expectations of Pastor at Vintage Durham that will bring about quantifiable church growth. I appreciate all of the support, wisdom and grace I have received over the past 4.5 years. It has been an honor being a part of the Vintage staff family and shepherding the members in Durham. This came as a surprise, and the elders of Vintage Church immediately set out with a plan to care for Aaron and his family. Aaron and Phabienne were valued leaders of Vintage Church Durham, and we are grateful for their time, labor, and love for the people of Durham. We also look forward to seeing what God will continue to do through their lives to build his church. The elders also immediately began working diligently to find a new local pastor to lead Durham, and are now pleased to announce Michael Darbouze as the Vintage Durham Pastor. Michael’s relationship with Vintage Church began when he reached out to Tyler Jones through involvement in Acts 29, a church planting network with which Vintage is involved. At that time Michael was considering planting a church, but was working with the Raleigh Rescue Mission as their church liaison. We hoped to further establish the partnership between Vintage and RRM, and Michael was helping us with that. They had discussions on church planting, and conversations were had about potentially planting a church in Southeast Raleigh. Since that time, Michael has been in the pipeline as a potential planter through Vintage or with Acts 29. Michael has most recently served as an associate pastor at a church in Garner, and it was after the Conversation on Gospel and Race that John Kerr reached out to Michael. They began meeting from John’s desire to have more relationships with people of color, at Leonce Crump’s urging to our whole church. We believe it is the work of the Spirit that has brought Michael as a pastor that is willing and feels called to step in so soon after Aaron’s resignation. We have labored to do due diligence in the hiring process with Michael. His skill set and desires match what we believe the role of Durham pastor needs, and he preached his first sermon on Sunday, June 10. 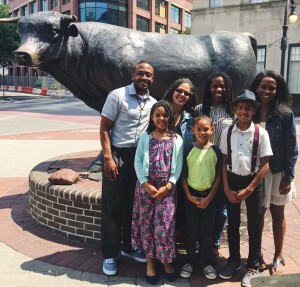 We hope you’ll join us in prayer over these transitions and join us in encouraging Michael, his wife Jomar and their children as they take on this new adventure. If you have questions about either of these announcements, we’d love to hear from you at info@vintagenc.com.